Come join the dances and celebration of life. The Glasto loos are legendary and all part of the rich festival experience of camping in the wonderful organic countryside of Somerset with over 115,000 other people. According to the festival organisers the toilets are cleaned and the slurry pits are emptied at least once a day - there were 22 poo trucks emptying in 2004. As soon as I awoke I knew I would have to go. The dreaded journey, the same one I had been repeating for two days and it was getting worse. You couldn’t imagine just how bad it could be. But that driving human instinct drove me to line up with the rest, all dreading our reactions when we finally reached the door and waded inside. Some were wearing scarves wrapped tightly around their faces now, giving them a sinister eastern appearance or in some cases more of an urban terrorist look. At least it protected them from the searing sun that beat down on us as we stood in our lines. Eye contact was hardly made this early in the morning, but you could see the fear in many as they neared their destination. There were more behind me now than in front as we shuffled steadily forward. Eyes were raised in unison when a Police Landrover approached the fenced enclosure, but after a quick look they drove swiftly past. I began to plan which option to go for as I could see my queue had the choice of two graffiti covered doors. There were no outward signs as to which held the most horrors; it was just down to luck. I felt close to bursting now as one man stood between me and relief. He was swaying gently in a hypnotic manner that made me long to copy him, just to take my mind off what was now becoming pain. His blonde dreadlocks swayed low down his back and I wondered how it felt to shake them round his head, or lay on them as he slept. He blearily watched a girl emerge then lurched forward, fumbling clumsily with the door, but finally finding his way inside and slamming it shut. I tried not to breathe through my nose now as acrid fumes filled the air. The door in front of me began to rock, then suddenly the whole cubicle slammed face down onto the dusty ground. There was a general cry of horror from the lines as we all heard the ghastly liquid ‘slosh’ from within. There was mass hesitation, until a few brave souls stepped forward and together rolled the metal box, so that the door was uppermost. Suddenly the occupant kicked it open, and amid the groans of pity everyone stepped back. We saw his dripping foot emerge first, followed by his soiled hands pushing himself up and out of his nightmarish prison…..covered from beautiful dreadlocks to open-toed sandals…in ……..urghhhhhh! Then he ran fleeing from the hundreds of eyes that were full of pity. I entered the portable toilets next door, which seemed a good choice. I’d be free from using them for a few hours now and could enjoy the last day at Glastonbury - but maybe not breakfast yet! Portable toilets are fine on the first couple of days - before the main influx of ticket holders, but after that they are a bit like Russian roulette. Avoid using the toilets in the main camping areas, and try and watch the expression on people coming out of them, as there can be some revolting sights lurking inside the innocent looking festival tardis. If its hot then they are pretty unbearable, some people take to wearing masks before they enter the dreaded zones - but nothing stops the smell, all you can do is try and hold your breath whilst you're inside. Blokes also have the option to visit the urinals, so there's no need to pee in the streams or hedges. Glastonbury's festival licence states there must be 300 metres of urinals. In 2004 it had 400m, plus 150m of 'She pee' urinals for women. It's worth queuing (even up to 45 minutes) towards the end of the weekend for the African pit latrines at the top of Greenfields, in the sacred space - King's Meadow. The charity Water Aid usually provides about nine of these - wish there were more. They are cleaned by volunteers and they give you a jug of water when you use them to help them stay fresh. It's a free service, but most people tend to give a small donation 'cos they're so grateful for the pleasant experience. WaterAid also distribute free drinking water to thirsty fans around the main stage. Glastonbury festival uses one million gallons of water over a period of five days. 'Shee-pee' loos: women-only urinals were introduced in 2004 - the girly pink screens were located at either side of the main Pyramid stage - you are handed a special, disposable cardboard funnel - called a P-Mate - to help you aim! The urinals are grouped in fours with dividing partitions between each one. They were policed to prevent blokes using them. Shee-pee urinals have been used at other festivals, including in the Netherlands and have proved very popular. As long as it keeps down the queues, whatever colour the better! 'Long drop' loos are the best choice as the festival gets under way - they don't smell much, but try not to look down as the roofless stable-doored stalls are positioned above a huge pit - its a long way down. Not many of them have locks so make sure you look out for feet before bursting in on anyone. We've all heard the urban myth of a baby being accidently dropped down the hole, but in reality take care your mobile/wallet/keys don't fall out of your pockets as you lower your jeans! You think it's bad now! Back in the 70's the 'toilets' were only hand dug holes in the ground, framed with scaffolding and rough strips of sacking dividing them off ...less people using them though. Coldplay last appeared in 2002 and were amazing, but in 2005 they pulled out all the stops and performed a fantastic 90 minute set - Chris Martin seems such a nice bloke and really knows how to connect with the Glasto crowd - makes you just long to share a cup of chamomile tea with him...Loved his quip, " Crazy frog where are you now?" !! The first record of their encore was the absent Kylie's ’Can’t Get You Out Of My Head’, which seemed a nice touch. 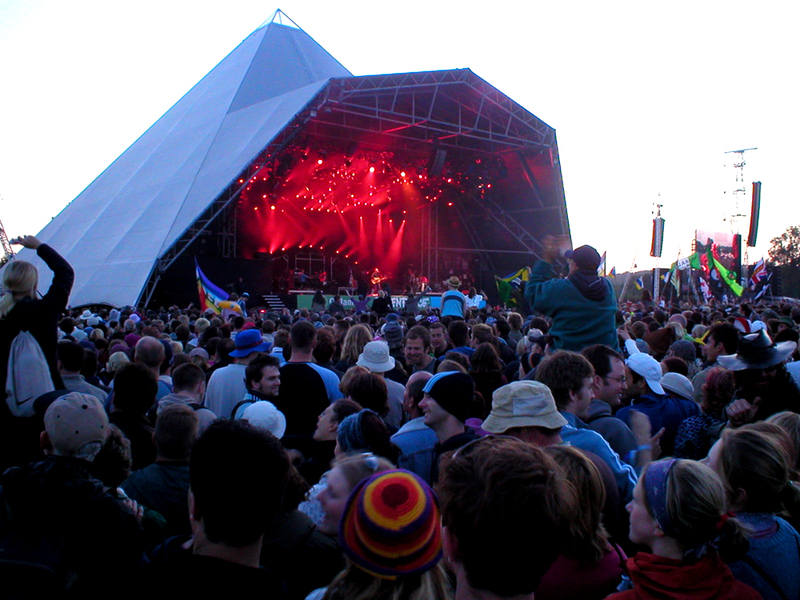 Michael Eavis has offered Kylie a headline spot at the 2007 festival. Las Vegas group the Killers surpassed all my expectations and stormed Pyramid stage and had the crowd singing themselves hoarse with such rousing numbers as, ’Mr Brightside’, ’Somebody Told Me’ and ’All These Things That I’ve Done’. They have truly arrived as a headline band this year - they set the festival alight last year in the New Bands Tent. Can't stop playing their cd since I've been back home. The White Stripes played a great set with a mix of their old hits and new material - where was Kate Moss when they played ’I Just Don’t Know What To Do With Myself’?!! * * * My festival favourites - Kaiser Chiefs - lead singer Ricky Wilson gave such a fantastic, energetic set - the audience was totally wowed with the recent hits, ’I Predict A Riot’, ’Oh My God’ and ’Everyday I Love You Less and Less’. Ricky threw himself into his performance...and the crowd! along with a giant inflatable dinosaur - I wanted it to go on and on...Ricky stayed around for the rest of the festival loving the unique Glasto atmosphere. Other highlights - where do you start? It was great to hear Garbage's Shirley Manson back again - her powerful vocals reaching the corners of the festival site. The sun shone on old Beachboy Brian Wilson on Sunday - the voice was frailer but the spirit of his music lived again - surfing the crowd became a reality for one girl as she stood on a malibu board held high. 112,000 tickets went on sale on Sunday April 3rd and were sold out in just over 3 hours. Michael Eavis had more than twice the number of operators this year selling tickets online and by telephone, which worked much better than last year's fiasco. The reality is that there are not enough tickets to go round - too many of us want to go to the best festival of the year! Ticket holders now require photo ID. The tickets are sold with identity cards which have a photograph of the carrier and include their name and address. No other sites or agencies are allocated tickets, they are only available from the official site. Apparently, to keep the locals happy 'noise stewards' will be employed for this year's festival. They will monitor noise levels in the village, so swift action can be taken to quieten things down if needed back at the site. The Glade Stage is being moved to the new dance area as part of the noise reduction plans. Also the dance tent will be given special 'silent disco' headsets, so the fun can continue into the night...quietly! As well as raising funds for Oxfam, Greenpeace, Water Aid, Make Trade Fair, and Forest Futures there are plans this year to donate money to victims of the Asian tsunami. The New Stage was re-named the John Peel Stage, in memory of the Radio One DJ. He was the voice of Glastonbury for many listeners and viewers of the BBC's festival coverage, and will be greatly missed. Peel's favourites, The Undertones, played a tribute to him. Winners of the Glastonbury Unsigned Performers Competition, The Mad Staring Eyes played a brilliant set. Every fifth year since 1987 has been taken off. After discovering a spring on the farm there are plans to build a reservoir, which will provide water for his huge influx of visitors. Eavis commented:" We don't do it because we have to do it and its not tied to commercial interests." It could only happen with the British climate - there we were all basking in the glorious heat, clad in bikinis and shorts happily putting up our tents - we'd all planned ahead and brought suncream - as we settled down to what promised to be the best summer festival ever......cut to Friday and we'd have all sold our souls for a pair of wellies! The arrivees on Friday didn't get the chance to get dirtier as the weekend went on - they arrived lagged! However, the magic of Glastonbury worked its spell and most of us kept smiling despite the sinking, sticky mud at its worst round the stages and market place. The people were as ever - chilled, happy and out to enjoy life that weekend whatever.....as ever there was great music and good company..
Worthy Farm, Pilton - a good time was had by all! We went on the Wednesday and got a great spot in Dragon field - near to the Sacred Space. We woke to an early call every morning as the dawn was welcomed at the standing stones with much drumming and cheering. The stones are a great place to chill and look across the mass expanse of multi-coloured tents - it's not too far from the non-smelly African pit latrines, although by Sunday the queues were miles long for the 9 loos provided by WaterAid. Sunshine and mud this year, but nothing damped down the Glastonbury atmosphere - another brilliant festival weekend, filled with fantastic music, theatre and a great crowd. All 112,000 were sold within 24 hours...it wasn't easy with website and phone lines seizing up. The website got two million applications in the first five minutes and 2,500 people called the phone lines every minute - many with no success. Michael Eavis apologised that 'the engineering specification was well short of what was needed', and assured that it won't happen in subsequent years...hope so. Friday - Oasis or Chemical Brothers or Levellers? We chose Oasis - good to hear their classic greats but didn't have the buzz we'd expected - they just seemed to go thro' the motions. Liked Liam's bearded artic action-man look - fur trimmed dazzling white parka - didn't say a lot but he's still got a great singing voice.Described by others as 'lacklustre'and 'grumpy' - the Gallagher brothers were rumoured to have argued just before their performance. Saturday - McCartney or Basement Jaxx? ...McCartney didn't do it for me,apart from 'Hey Jude' - which was heard being sung all over the site for hours afterwards! - and the firework filled 'Live and Let Die' was fun, but most of the old songs sounded so much better when there were four of them. Sunday - Orbital or Muse? ... opted for Muse and wasn't disappointed - a brilliant end to the festival - really carried the crowd up to the starry skies. Heard Orbital were brilliant - wished they'd been on at a different time. Oasis first performed at Glastonbury 10 years ago, but apparently were too drunk to enjoy it! They recently released 'Definitely Maybe -- The DVD' - marking the 10 year anniversary of their debut album. Shame they didn't seem to enjoy it! This was Paul McCartney's first performance at Glasto, he was turned down in favour of Radiohead last year. McCartney described Glastonbury to The Guardian as: 'it's the great festival; the ongoing Woodstock'. His Saturday performance ran over the curfew by 15 mins, but he offered to pay any fine. Orbital played their final live show at Glasto - Other Stage on Sunday - as they are splitting up after 15 years. It was their 5th Glasto appearance. Q magazine named their 1994 Glastonbury performance as one of the 50 greatest live gigs of all time - they really went out on a high. Morrissey, the former Smith's lead singer, relaunched his career this May after 20 years with the new single 'Irish Blood English Heart', which reached No.2 in the UK Top 30. He last played at Glastonbury in 1984, and proved that 2 decades later he can still strut his stuff. Glastonbury virgins Snow Patrol were brilliant on the Other Stage, really lifting the crowd's spirits with their hit ballad 'Run'. In 1970 Michael Eavis - inspired by the Bath Blues Festival - organized his Pilton Pop Festival in Sept. Marc Bolan and T. Rex headlined - arriving in a velvet covered limo. Entry for the lucky 1,500 was £1 and included free milk! 1971 The now legendary Glastonbury Fayre was timed for the Summer Solstice in June, and featured the first Pyramid Stage built near a ley line - making the most of the natural energies in the magical vale of Avalon. David Bowie (on stage at 5a.m! ), Pink Fairies, Hawkwind, Fairport Convention, Arthur Brown, Quintessence, Melanie, Joan Baez. No alcohol sales and veggie food only, midnight curfew for amplified music. 1972 album released of the festival music and film 'Glastonbury Fayre' - free entry to even luckier 12,000. 1972 A small free festival with Hawkwind performing. 1978 An unplanned free festival following the Stonehenge Free - about 500 attend. 1979 Extended to 3 day event and theatre performers joined the musical acts. Peter Gabriel, Steve Hillage, Sensational Alex Harvey Band, Genesis, Leyton Buzzards, Nona Hendryx and Tom Robinson - entry was £5 and 12,000 attended. Profits to UN Year of the Child, despite large financial loss. 1982 - Jackson Browne, Richie Havens, Van Morrison, Aswad, Roy Harper, Judy Tzuke, Alexei Sayle in Theatre - £8 entrance for 25,000.Muddy. 1983 Due to local Government Act Glastonbury Festival requires a public entertainment licence. Radio Avalon hits the airwaves - Marillion, UB40, Curtis Mayfield, Fun Boy Three, The Beat, The Chieftains, Melanie, Alexei Sayle - £12 for 30,000. Profits to CND and local charities. 1984 Now an annual event - first Green Field introduced - The Waterboys, Ian Dury, Elvis Costello, Fairport Convention, Howard Jones, Joan Baez, Billy Bragg, The Smiths, Paddy Ashdown and Bruce Kent are speakers - entry £13 and 35,000 attended. £60,000 to CND. 1985 Festival site has grown 100 acres - Joe Cocker, Aswad, Roger Chapman, Boomtown Rats, James, The Pogues, Ian Dury, The Style Council, Echo and the Bunnymen - £16 for 40,000. £100,000 raised for charity. Muddy. 1986 Classical tent added - The Cure, Madness, Simply Red, The Pogues, Level 42, The Psychedelic Furs, The Go-Betweens, The Housemartins, The Waterboys, Billy Bragg - £17 entrance for 60,000. £130,000 raised for CND and local charities. Ben E. King, Van Morrisson, Billy Bragg, The Communards, Elvis Costello, Gaye Bykers on Acid, New Order - £21 entrance for 60,000. £130,000 raised for CND and local charities. Rain. 1990 Now officially The Glastonbury Festival for Contemporary Performing Arts - The Green Fields are extended to 60 acres. Circus, comedy, theatre and cabaret areas. Travellers and security clash causing £50,000 worth of damage -The Cure, Paul Oakenfold, Happy Mondays, Lush, Sinead 0'Connor, James, Ry Cooder, Aswad, De La Soul - 70,000 bought £38 tickets. £100,000 raised for CND and local charities. 1992 Jazz world stage added - The Levellers, Tom Jones, Primal Scream, The Shamen, Blur, Lou Reed, Shakespear's Sister, PJ Harvey, The Shamen, Youssou N'Dour, James, Billy Bragg - £49 for 70,000. £250,000 profits now go to Greenpeace, Oxfam and local charities. 1993 - Robert Plant, Lenny Kravitz, The Orb, Alison Moyet, Hothouse Flowers, Lenny Kravitz, The Kinks, Van Morrison, Stereo MCs, Verve, Jamiroquai, Suede, Lindisfarne, Rolf Harris, Velvet Underground, The Lemonheads - £58 tickets for 80,000. 1994 The year the Pyramid burnt down, first live festival tv broadcast - Manic Street Preachers, The Levellers, Beastie Boys, Paul Weller, The Pretenders, Johnny Cash, The Lemonheads, The Boo Radleys, Echobelly, Nick Cave, Oasis, Chumbawamba, Pulp, Radiohead, Blur, Saint Etienne, Orbital, Bjork, Elvis Costello - entry £59 for 80,000. £300,000 raised for Greenpeace, Oxfam and local charities. 1995 Dance Tent added, fences pulled down - Pulp, Oasis, Elastica, PJ Harvey, The Cure, The Stone Roses, Orbital, Prodigy, Jamiroquai, Simple Minds, Massive Attack, Sleeper, Portishead, Supergrass, Shed 7, The Verve, Elastica, Ash, Dodgy, Goldie, Tricky - entry £65 for over 80,000. - Portishead, Lightning Seeds, Tricky, Robbie Williams, Primal Scream, Nick Cave, Pulp, Tori Amos, Babybird, Underworld, Blur, Divine Comedy, Faithless, Moby, Prodigy, Fatboy Slim, Idlewild, Squeeze, Bob Dylan, The Doves - £80 tickets for 100,000. £500,000 to Greenpeace, Oxfam, Water Aid and local causes. 2002 £1m super-fence erected - Rod Stewart, Doves, Coldplay, Faithless, Ash, Nelly Furtado, Dandy Warhols, The Waterboys, The Charlatans, Fatboy Slim, Stereophonics, The White Stripes, Black Rebel Motorcycle Club, The Bees, Starsailor, Ian Brown, Badly Drawn Boy, Roger Waters, No Doubt, Rolf Harris, New Model Army, Lost Prophets - tickets £97 for 100,000.